Sri Lanka's President Maithripala Sirisena has named his predecessor, Mahinda Rajapaksa, as the country's new prime minister after the collapse of the governing coalition. He sacked Premier Ranil Wickramasinghe after the president's United People's Freedom Alliance party (UPFA) quit the government. Mr Sirisena beat Mr Rajapaksa in the 2015 presidential election. Opponents say the move is unconstitutional. Finance Minister Mangala Samaraweera called his leader's sacking "an anti-democratic coup", saying Mr Wickramasinghe remained leader as he could not constitutionally be removed by the president. And Cabinet spokesman Raitha Senaratne told the BBC that Mr Wickramasinghe remained the country's prime minister. President Sirisena had been an ally of and minister under Mr Rajapaksa before turning against him. Mr Wickramasinghe helped the president triumph in the 2015 poll, but the pair reportedly clashed in cabinet recently over government plans to lease a port to India. The prime minister and his United National Party (UNP) came to power promising accountability for alleged atrocities committed in Sri Lanka's civil war and during Mr Rajapaksa's administration. Mr Rajapaksa ended the civil war in 2009, but faced criticism for the means buy which he achieved victory - many thousands of Tamil civilians are thought to have been killed by government forces in the final months of the fighting. Over the 26-year conflict, between 80,000 and 100,000 people are estimated to have died, with both sides alleged to have perpetrated war crimes. Moreover, the former president is also accused of corruption on an epic scale, along with his inner circle. 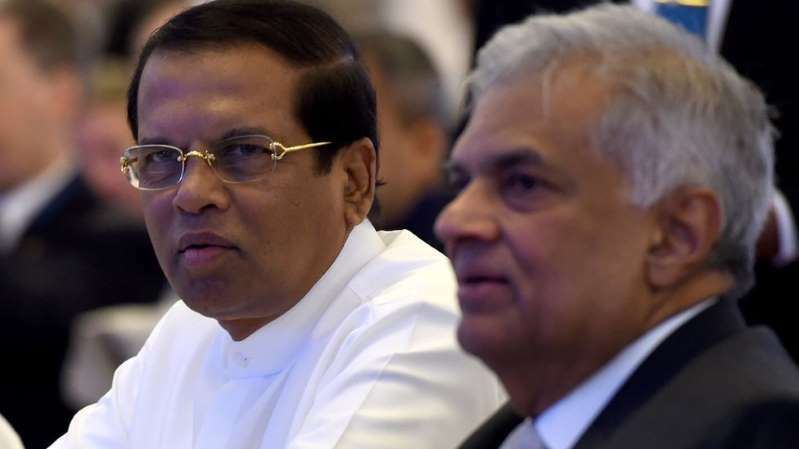 President Sirisena told the BBC shortly after his election victory that he planned to set up a domestic inquiry into the alleged civil war atrocities. But poor headlines have dogged the president in recent weeks, tarnishing his image. Mr Sirisena had to call India Prime Minister Narendra Modi earlier this month after reports that he said the Indian secret service was plotting to kill him at a cabinet meeting. And in September he railed against national carrier Sri Lankan Airlines for serving him sub-par cashew nuts.